In the drum reconditioning process, our customers ship drums that are R.C.R.A. empty to our plant. Their drums are then cleaned, painted, and necessary parts are replace. 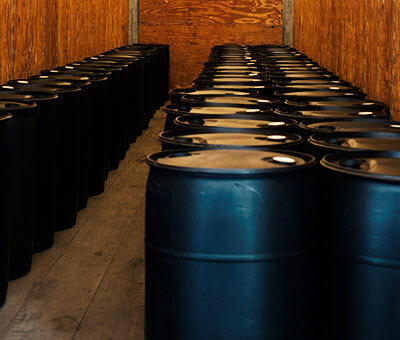 Drum disposal may also enter into the reconditioning process, since all drums may not pass testing requirements allowing their drums to be returned for reuse. The customer then receives back the same drums they shipped to Jones Barrel Company – reconditioned and ready for reuse. In accepting your empty containers for reconditioning, you must comply with the same guidelines found in the Services Section under Empty Containers. It is important that personnel who are responsible for emptying your containers are aware of the definition of R.C.R.A. empty. We have posters available that explain R.C.R.A. empty drums that could be used at your location. This also helps to insure that the product our customers have purchased for their use is not wasted. It is important for our customers to understand that if we receive a container at our dock that is not empty according to R.C.R.A. standards, that container will not be removed from the truck. They will be marked as not empty, left on the truck, and returned to the sender freight collect. We will work with you to develop a partnership to insure proper handling of your empty containers.